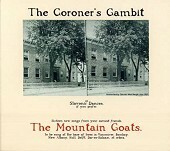 Delivering old time folk with the same airy recording quality and timelessness to it, The Mountain Goats' The Coroner's Gambit is an amazingly well-composed collection of acoustic guitar, warm vocals, and well-written lyrics, flushed out with very little instrumentation to retain its heritage. The Coroner's Gambit is an album you'll put on the stereo, instantly warm up to, and then dread the moment you have to take it off the stereo - so you won't. An instant winner that you won't tire of any time soon. I'll give it an A.